"It was maybe a little bit of therapy for him. ... I think it was a good reaction," said longtime coach Guillaume Marx, noting Auger-Aliassime wasn't happy with his serve in the two-tiebreak loss to world No. 10 John Isner of the U.S.
"He doesn't kick back and relax too much. He wants to get better. We can see it every day." Tennis fans around the world are starting to see it, too, after the 18-year-old Montreal native's eye-opening start to the 2019 campaign. Playing for the first time since the loss to the big-hitting Isner, Auger-Aliassime got back on the winning track Tuesday with a 7-5, 7-6 (5) win over Argentine qualifier Juan Ignacio Londero on clay at the Monte-Carlo Masters. He'll face a tougher test on Wednesday against world No. 3 Alexander Zverev of Germany in the second round of the ATP Tour Masters 1000 event. Auger-Aliassime has been getting better all year. The teen, who finished 2018 ranked 108th in the world, vaulted to 33rd after becoming the youngest semifinalist in Miami tournament history. He's currently the youngest player in the top 100. He started working with Marx soon after. The coach remembers a lanky kid who was already hitting the ball "quite hard." "What was special was the energy and the intensity in what he was doing," Marx said. "He's very committed so it's easy to work with him," he said. "It's not something you can really teach. It's inside of him because he likes playing. It's very important to him." "He has a strong game from the baseline so he's able to hit very hard, service, forehand, backhand," said the coach, who's been working with Auger-Aliassime and Marx since 2017. Lately, he's been using his six-foot-four-inch frame to get to the net, improving from a baseline player to a full transitional game. "He's the kind of player who of course is very athletic but he has a lot of variety in his game," he said. "It's a lot of fun to watch." "On clay courts, you have to learn how to beat the point, mentally you have to be strong because the rallies are longer," he explained. The decision has paid off. Auger-Aliassime's first ATP Tour final came on clay at the Rio Open earlier this year and he's now gearing up for the French Open, the lone clay-court Grand Slam, next month. "This was a good test for him to be playing these European, clay-court challengers (last year)," ESPN analyst Brad Gilbert said. "And to see him come through those and get better was a great sign." There's still work to be done, though, Gilbert said, noting that Auger-Aliassime doesn't have a "very big" serve yet. The teen's friend and doubles partner, Denis Shapovalov of Richmond Hill, Ont., has a much bigger serve despite being about four inches shorter and 30 pounds lighter, Gilbert said. "If (Auger-Aliassime) develops a monster serve, watch out," he said. "I really enjoy watching his progress and watching what he's doing," he said. "I like where he's headed." Auger-Aliassime knows that people are expecting big things from him. But he doesn't stress much about the pressure or attention, Perrotte said. Instead, he's interested in reading books, watching movies or sharing a meal with his family. He and his coaches talk about a wide variety of subjects while on the road, from tennis tactics to politics. "It's interesting as coaches to have a nice kid like Felix," Perrotte said, adding that Auger-Aliassime's passion for tennis helps keep him focused. "I think he knows that he has to stay feet on earth and he knows that he has to also keep enjoying playing," he said. 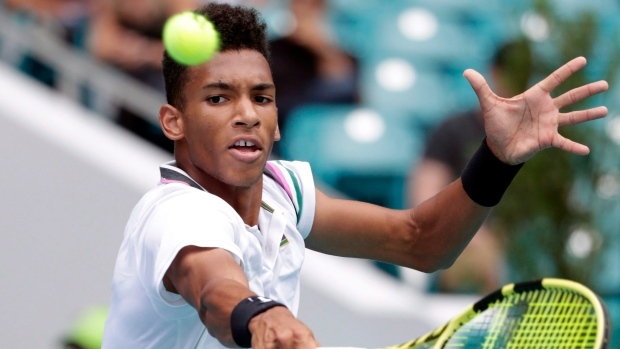 Like many teens, Auger-Aliassime often updates his Twitter and Instagram, sharing photos from his most recent match or cheering the accomplishments of fellow young Canadian tennis stars like his "big bro" Shapovalov and Bianca Andreescu. Occasionally, he'll post a video of the latest song he's learned to play on piano or a picture from a recent photo shoot. "He's just 18 but there's a lot of expectation around him of course with the media, from himself, from the world of tennis who are expecting a lot from the next generation," he said. "But he's handling it well because he has a great education from his parents. We are trying to focus on the process." How far he'll go remains to be seen, Marx said. "I cannot really think of a limit," said the coach. "We just keep working day-by-day with a long-term plan. Obviously, I think he's going to be very strong. How strong, it's hard to say."